We already knew that we were moving to Switzerland (although hardly anybody else did), so after our original plan to spend New Year in Iceland fell through due to the flights being so expensive, we decided to start the year in our new country. Midnight found us clinking mini sparking wine bottles on the banks of the Zürisee (Lake Zurich) before the offficial fireworks were set off at quarter past the hour. I then returned to work, where I informed my boss that I would be moving to Switzerland. Thankfully, I ended up not having to quit because I was offered a telecommuting contract instead. Phew! I was then able to tell my colleagues, and finally announce the news on my blog. The rest of January was fairly uneventful, although we did begin the process of preparing for the move – responding to a few ads for flats in Basel and writing a cancellation letter for my Bahncard 100. This month was mainly taking up with flat hunting – reading ads, emailing people, phoning people and travelling down to Basel to look at flats. It was a very busy and frustrating time! We did manage to have a look round Basel zoo on one of those trips though. In March, we finally actually found a flat! It was the 24th one we had looked at (out of 25) and was also the one with the most expensive rent, but it was also our favourite and to be honest by that time we’d given up being concerned about money. We just wanted somewhere to live! We signed the contract on Friday the 13th… not so unlucky for some! We then began the process of packing our entire lives into boxes ready for the removal men to pick up. At the end of the month, we had a leaving party, for which I made Toblerone cheesecake (yay, something crossed off my 35 before 35 list! ), the removal men took away all the boxes and most of our furniture – leaving me to spend a month in a flat that contained a bed, a coffee table and two folding chairs – and Jan moved to Basel ready to start work. Jan started his new job on 1 April and also got Internet set up in the new place so I could actually start working from home once I moved. In the meantime, I sorted out the remaining things that still needed doing back in Karlsruhe, including cancelling the Internet there and cleaning all the things! For Easter, I took a trip down to Basel to help Jan with some of the unpacking and furniture arranging. We also took a walk in the woods near our new home, where we spotted what I think was a mouse. On the 26 April, I finally moved to Switzerland, but before that we did a beer tour of Karlsruhe with some friends. A fitting way to say goodbye to the place I had lived in for longer than any other! This month saw me exploring my new home, in between unpacking more boxes and getting used to working from home every day! I also started the process of applying for my Swiss residency permit (including multiple trips to the Gemeindeverwaltung!) and joined in with Foodie Penpals for the first time. June saw us exploring Basel some more, as well as taking part in a traditional walk around the boundary of our own small town. We also took a trip to Fribourg (also called Freiburg, but not the one in Germany) and I actually received my residence permit (Aufenthaltsbewilligung). Yay! I then wrote a post on how to move to Switzerland with a partner you’re not married to (just thought I’d throw that in there in case it’s useful to anyone). June always seems to be the month with all the long weekends, and 2015 was no exception, so we took advantage of that fact and went to Luzern and Mount Pilatus for the day. The top was mostly in the clouds, but it was still pretty great (but cold!). We also hiked from Sissach to Liestal on one weekend and on another visited a street food festival in Olten. Phew! A busy month. In July, we took a walk to Mariastein Abbey, visited the beautiful church there and then walked to Landskron Castle. We saw bees there, which made me very happy! Jan’s mum and her partner came to see us for a day since they were on holiday close by. It turned out to be the hottest day of the year and it was waaay to warm to walk around much, but we showed them a bit of Basel. At the end of the month, I flew to England alone to attend my cousin’s wedding. It was a very brief visit, but it was lovely to see so many family members in one place! Long term readers may remember that August is my birthday month. 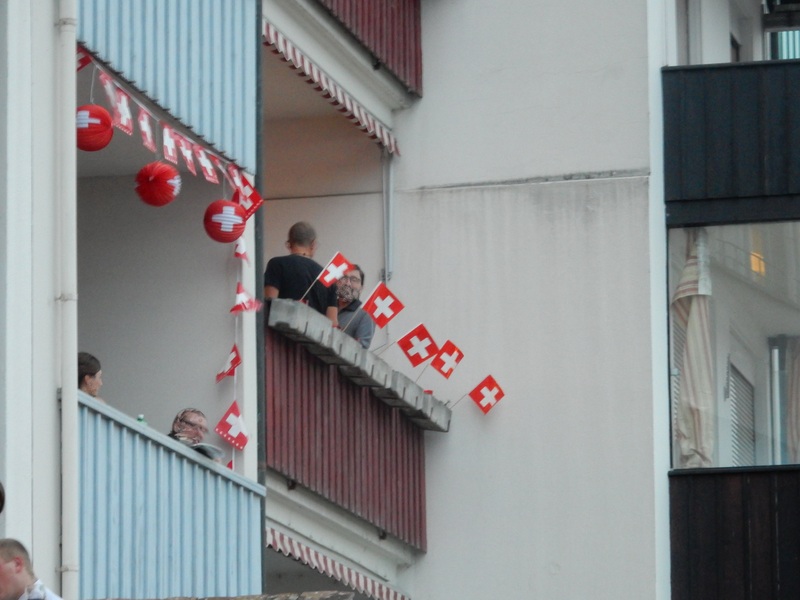 It turns out it’s also Switzerland’s – they celebrate their national holiday (Bundesfeiertag) on 1st August. So this month started with fireworks and Swiss flags. I spent my own birthday working, but we did go out for delicious Thai food in the evening. Later in the month, we took a trip to a butterfly house (where we saw real live toucans!) and some friends came down from Karlsruhe to belatedly celebrate my birthday with me. The day they were here, all of Basel’s towers had an open day so we went up the one that’s closest to where we live, Spalentor. A friend came all the way from Luxembourg at the beginning of the month to watch the Lion King musical with us, and we also visited the Tinguely Museum with her. We finally managed to buy a proper ceiling light for my “office” – useful as the days were starting to get shorter! And I started my Christmas stitching to make sure it would get done in time. We also visited Karlsruhe to see Jan’s former choir perform at an annual festival. Finally, a holiday! My first since I took a week off to move in April. We flew to England on 1st October so we could go out for a meal with my brother on the 2nd for his 25th birthday! We also attended three World Cup rugby matches, saw the “Wave” sculpture in the Yorkshire Sculpture Park, visited Manchester and Alnwick (which I haven’t actually posted about yet!) and met up with many friends and family – all over the course of a mere 10 days! Having returned to Switzerland, we briefly relaxed before taking a trip to Germany on Halloween for the Ludwigsburg Pumpkin Festival. A lot of cross stitching happened this month! Apart from that, we went to Engelberg-Titlis for a day (blog post to follow! ), took a trip to Karlsruhe for my friend’s flat warming party and, at the end of the month, went to Colmar for the day to visit the Christmas markets. I barely managed to blog in December thanks to all the Christmas card stitching I was doing! We also briefly went to Karlsruhe to watch Jan’s former choir perform, returning immediately after the concert because Jan was also singing with a choir that evening! The next day, two of my colleague’s came down to Basel to visit the Christmas market and the following weekend we went to Bern where we visited the Christmas markets and looked around the town (blog post to follow). This means I’ve now completed the “visit 5 Christmas markets” item from my 35 before 35 challenge! Christmas was spent with Jan’s dad and his partner, before we headed up to his mum’s for a few days on the 26th. While we were there, we spent an afternoon in Göttingen and for the first time I actually managed to take photos there! (That’s another post that will follow). We returned to Switzerland on the evening of the 28th, leaving us two days to get everything sorted ready for our friends arriving on the 31st. We all ate raclette together (when in Switzerland…) before heading into town to watch the fireworks over the Rhine… and thus, for the first time since we’ve been together, Jan and I actually finished the year in the same country that we started it in! Overall, 2015 was a year of big changes and we spent most of it getting used to our new home and, in my case, a new way of working. We also managed to see quite a bit of our new country, which was nice. Tomorrow, we leave for England for a few days, where we will be helping my sister celebrate her 30th birthday, and after that I’m looking forward to relaxing for a bit and getting back into a routine before we start thinking about what 2016 might bring! Saturday was the 1st of August (what? How did that happen?! 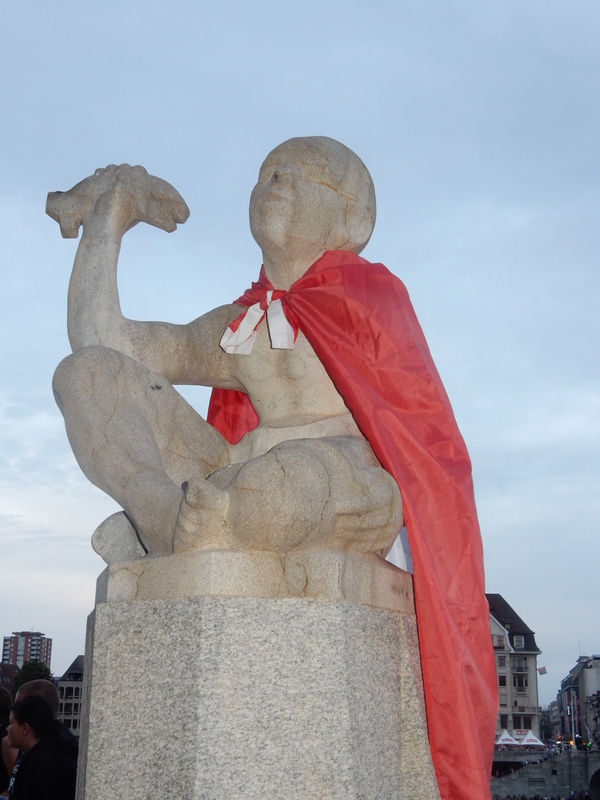 ), which in Switzerland means Bundesfeier or Swiss National Day. Supposedly, 1 August was the date on which the original three cantons, Uri, Schywz (which gave Switzerland its name) and Unterwalden (which no longer exists as a canton) signed the Federal Charter of 1291. 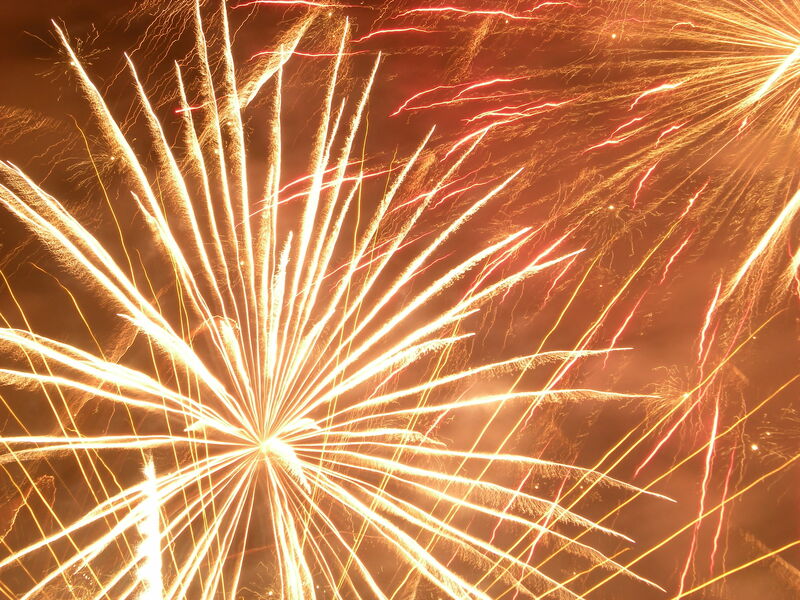 Unlike in Germany, where Reunification Day is a solemn occasion, in Switzerland National Day means fireworks! Lots of fireworks! And Basel isn’t content with just celebrating on one evening… the unofficial fireworks display (unofficial in the sense of not on the right day, they were organised by official people!) was on Friday evening on the Rhine then there was a second celebration in the Bruderholz area of the city on the actual day. We attended both, but I got the feeling most people only went to the celebration on the Rhine… things were certainly a lot more crowded there anyway! Our first stop on Friday evening was at Marktplatz. The town hall was all decked out in Switzerland and Basel-Stadt flags, there were food stands, and a Dixieland band was playing. We each purchased a sausage then ate it while watching the band for a bit before moving on. Lots of people go all out for the national holiday. There were flags, bunting and lanterns in red and white everywhere! After the fireworks, we walked down to the next bridge, crossed over to see what was on the other side of the river (lots of loud music, cocktails and a much younger audience! ), ate raclette from one of the stands there and then headed home. The next night, we went to the official celebrations for Basel-Stadt in a field up on the Bruderholz. Our own town was holding its own celebrations, but we chose not to go as there weren’t any fireworks (the place they would have been set off was subject to a ban due to them being too close to the woods after the extremely dry weather we’d been having – ironically, it was raining when we left the house!). Being official, these celebrations involved a speech by the president of the Gemeinderat (municipal council), but also various forms of entertainment, including presentations by the Schweizer Tambouren und Pfeiferverband (Swiss drummers’ and fifers assocation). They were very good, with even the youngest performers keeping perfect time! The final group of drummers wore skeleton masks and played with fire, which was kind of fun. In between drummers drumming and pipers piping, people in traditional dress danced and we ate yet more sausages. Also, I couldn’t resist the Swiss cows on sticks being sold at the cake stand! After the speech by the official and the drummers’ final performance, there was a fire show then two singers performed what they called “a tribute to the national anthem”. I think the organisers had expected them to actually sing the national anthem, which is why the progamme for the events had the text printed on the back, but oh well! What they actually sang was something weird in English with one line from the national anthem in each of the national languages in between. Not what I was expecting! Then, finally, those who weren’t already standing out in the field headed over to the bonfire to watch the main event… fireworks! Actually, people had been setting off their own fireworks all evening (there was an official area for it), even before it got dark, but of course only “official” people are allowed the really impressive ones! The fireworks went on for about 20 minutes, after which we headed off to find a tram that would take us home – we had walked across the fields to get to the event, but I didn’t fancy taking the same route back in the dark! Yesterday, I read that there is also a regular fireworks display over the Rhine Falls on 31 July, so I’ve now decided I need to see that one some day. A fireworks display over the largest plain falls in Europe has to be pretty spectacular! (And by the way, if anyone would like to explain to this idiot what a “plain waterfall” is that would be fabulous 😉 ). 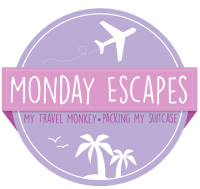 It’s Monday, so I’m linking up with Packing My Suitcase and My Travel Monkey again for the latest edition of Monday Escapes. New Year’s Eve dawned bright and sunny… which was a bit of a waste really seeing as we’d decided to spend the day at the Landesmuseum (Swiss national museum). I did take a couple of photos of the building before we went in though, luckily. They ended up being my only blue-sky photos of Zurich! In the museum, we learned a bit about Swiss history, including their policy of being neutral during the world wars and also the fact that the final canton only gave women the right to vote in 1990! (That would be you, Appenzell Innerrhoden. Tut, tut, tut!) There was also an exhibition of Swiss furniture and a whole section on archaeology. We decided to skip the special exhibition on Christmas cribs (nativity scenes) as we were all museumed out by that time and also it was closing soon. It was nearly 5 o’clock by that time and we hadn’t eaten since breakfast so we headed into the train station to grab some soup and a sandwich from one of the cafes there. We did 90% of our eating at the train station because it was the only place that had even vaguely affordable food (bakeries have fairly normal prices… restaurant food is almost double what we would expect to pay in Germany!). We then went for a bit of a walk around, ending up by the university which is on a hill and provides a nice view over Zurich. Once we were back in town, we went for a quick beer then decided to head back to the hotel for a bit and chill before joining the festivities at the lakeside. We watched Pirates of the Caribbean, which Jan had somehow never seen before! Some of the fireworks formed shapes, like hearts and smiley faces, but it was difficult to capture that on camera. You can just about make out a face (upside-down!) on one of the photos above, though. After the fireworks, the lakeside cleared fairly quickly. I assume people wanted to get into the warm! Although it wasn’t as cold as on the previous day, there was still snow on the ground. I finished my Prosecco (which Jan had been holding for while I took photos), then we walked around for a bit looking for some interesting food to snack on. We finally chose a stall selling Indian food, where we bought some delicious samosas and pakora. It was after 1 by this time and I didn’t really feel like going into a crowded bar, so instead we headed back to the hotel and switched on the TV. Not a bad start to the New Year!